Home Entertainment PBB All In Big Winner PBB All In Updates Pinoy Big Brother Television Who Will Be the Big Winner on the BIG NIGHT of PBB All In August 24, 2014? Who Will Be the Big Winner on the BIG NIGHT of PBB All In August 24, 2014? Who will be the Big Winner on the BIG NIGHT of PBB All In on August 24, 2014? The PBB Big 4 who made it to the finals of PBB All In were Maris Racal, Daniel Matsunaga, Jane Oineza and Vickie Rushton. Loisa was evicted on the 13th and the last eviction night. The answer to this lies in your hands. If you have your cellphones with you, your sim has the power to lift up your desired housemate who will be crowned tomorrow, 8:45 PM as the Big Winner on “The Big Night” at the Resorts World in Pasay City. You can choose among the four housemates who made it to the Big 4 your Big Winner for tomorrow’s event in the persons of Daniel, Maris, Vickie and Jane. And if you wish to attend the Big Night on the given place, you have to determine who among the housemates you support or would like to become the Big Winner because that will determine the color of your shirt or dress. For Team Maris you have to wear Sky Blue. If you are from Team Daniel you are encouraged to wear Yellow. Red is the color for Team Jane. And for Team Vickie is Violet. This will be a colorful Big Night for all the supports of the Big 4. 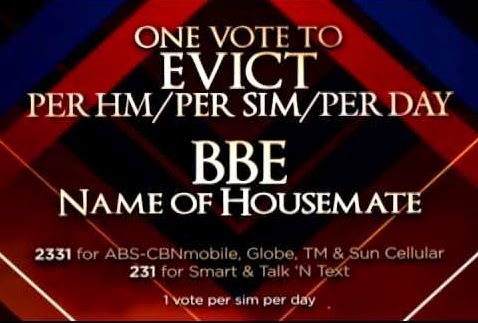 “One Power to Vote” is the concept of voting for your favorite housemate. Aside from this, you are also given the power to evict the housemate you would not like to have the Big Winner crown. Well, this is a strategy that you need to master or learn about that is why you are encouraged to vote wisely. Every vote is important since your sim will only function once and time is limited. Who among Daniel, Vickie, Jane and Maris deserves to bring home the Big Winner crown? Well, your votes will answer the question tomorrow.